If we had to guess Rosie Huntington-Whiteley’s approach to her (covetable) everyday style, we would definitely go with “if it ain’t broke, don’t fix it.” Why? Because she generally sticks to a short list of high-end brands that not only look amazing on their own but also somehow seamlessly mix to create the perfect model-off-duty uniform. From bags and belts to dresses and separates, she really has all her sartorial bases covered. Scroll through to see which brands top her list, and then continue to shop our under-$100 Rosie-inspired picks! On Huntington-Whiteley: Saint Laurent Studded Medium Bucket Shoulder Bag ($2512). On Huntington-Whiteley: Saint Laurent Peacock Print Skater Dress ($2594). On Huntington-Whiteley: Saint Laurent Leather Biker Jacket ($4990), shirt, and Chain-Strap Debbie Ankle Boots ($1395). On Huntington-Whiteley: Janessa Leone Leone Lucy Hat ($140). On Huntington-Whiteley: Janessa Leone Rhonda Hat ($170). On Huntington-Whiteley: Janessa Leone Amelia Hat ($165). On Huntington-Whiteley: Chloé Spotted Drop-Waist Silk Dress ($1268). On Huntington-Whiteley: Chloé White Metallic Jacquard Tie Cuff Jacket ($3370) and Medium Clare Shoulder Bag ($1736). On Huntington-Whiteley: Jacquie Aiche Shaker Diamond Bezel Choker ($5375) and 19 Diamond Bezel Choker Y Necklace ($5000) in 14K Rose Gold and Diamonds. On Huntington-Whiteley: Jacquie Aiche 5 Spaced Out Pave Mini Pyramid Triangle Necklace ($3875) and Shaker Diamond Bezel Choker ($5375) in 14K Rose Gold and Diamonds. On Huntington-Whiteley: Étoile Isabel Marant Enid Reversible Quilted Cotton Coat ($399) and Isabel Marant belt. On Huntington-Whiteley: Isabel Marant Herringbone Wool Gabriel Blanket Coat ($845) and Étoile Isabel Marant Laura Perfect Tee ($105). On Huntington-Whiteley: Isabel Marant Fall 2015 bomber jacket and Étoile Isabel Marant Laura Perfect Tee ($105). On Huntington-Whiteley: Paige Denim Bellamy Button Front Denim Shirt ($209) in Eiffel and Skyline Skinny Jeans ($169) in Black Shadow. On Huntington-Whiteley: Paige Denim Hoxton High Rise Ultra Skinny Stretch Jeans ($169). On Huntington-Whiteley: Paige Denim Daphne Ankle Zip Black Leather Pants ($895). 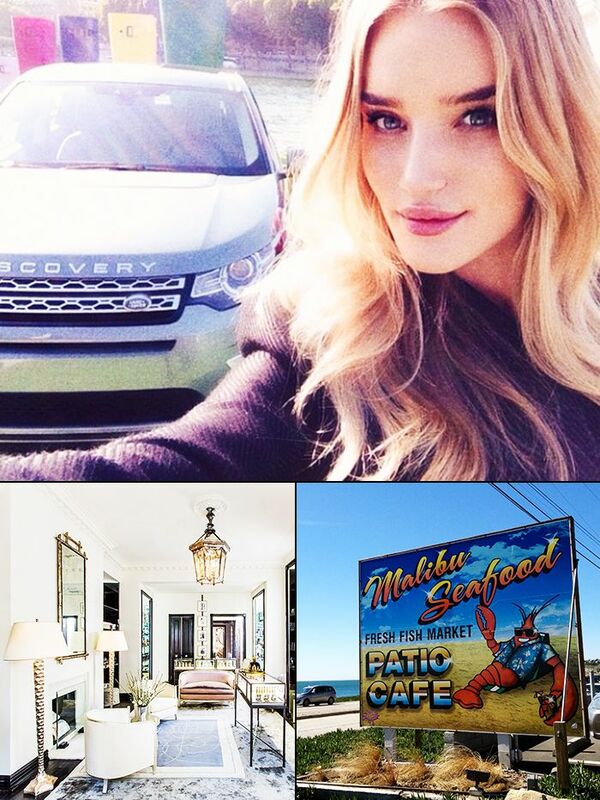 Continue to shop our Rosie Huntington-Whiteley–inspired picks, all under $100! Get an extra 20% off Need Supply with code GET20. If you could wear any brand for the rest of your life, what would it be? Tell us in the comments!